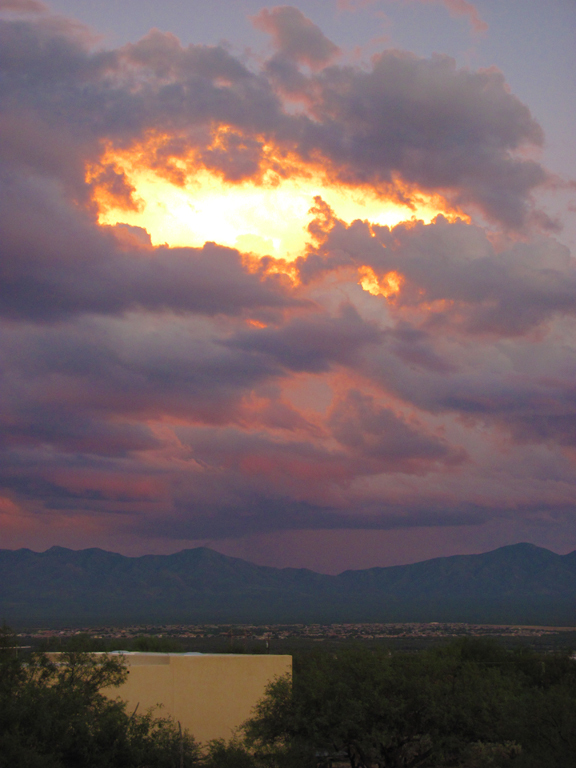 A view from Todd’s Backyard (from the top of the shed), overlooking Quail Creek and the Santa Rita mountains. Today Todd and I are celebrating our 20th anniversary! How time flies… and it’s flown by, for the most part, with my head in the clouds. I’m not saying that I’ve been obliviously detached from reality, or the goings-on of the rest of the world. But, I’ve taken refuge from the stress and craziness of life in our own little paradise we call Todd’s Backyard. Lately though, reality has interrupted. Over the past year or so we’ve had a weekly gathering on our back porch that we have dubbed the Friday afternoon ‘think ‘n’ drink tank’. Our neighbors gather to enjoy the views and discuss issues ranging from ridding pack rats to solving the world’s woes. If only we could solve the world’s woes! But one of our topics of discussion has been preparing for a state of emergency. We are all in the process of gathering and storing supplies. For what?….We are not totally sure, but one thing for sure is that the world is changing. Since we live very close to the Mexican border, we have been in the midst of the border wars now for years. It has become common place to see Border Patrol vehicles everywhere and go through checkpoints on a regular basis. It’s not uncommon to see busts along the side of the interstate, with illegals sitting in handcuffs and armed patrol men standing guard or chasing their amigos through the desert, abandoned car left on the side of the road. We have seen evidence (piles of empty backpacks/trash) of illegals coming through property very close to us…even through the wash in our backyard. Scary? ….Well, yes, but thank God we live in a state where we can be armed and our neighborhood is well defended. But, I never thought that I would be living in times like these…It is the wild west! I wonder how history might look on this? We tend to think that everything will always stay the same. Will we still live here in a year?…5 years… until we die? I hope so. Will we be able to live here unharrassed and securely?…I don’t know. Todd’s job is tenuous and my little business is up and down. Certainly, in this economy, we don’t have the kind of careers that prosper.But we seem to be holding on.I know that we are doing what we are supposed to be doing! And even if we have to move on, we have been so blessed to have had the time, inspiration and community we have been able to cultivate in our stewardship of this property….Todd’s Backyard. We have been so lucky to share Todd’s Backyard with the world, and perhaps in doing so, sharing a little bit of solice and inspiration for anyone that might be going through hard times. The world is changing. We are prepared. Hey Todd and Rhondi….We just wanted you to know that we do so enjoy your postings to Todd’s Backyard and we pray that you both will survive these tough times. We cherish you guys as being some of the best people we have the privilege to know. Hang in there. If we can change our “leader” and his administration, it will be the best thing for our future and the future of our beloved country. Love you guys!! Curly and Jim.